In the face of difficult and challenging decisions, the natural graft replacement technique we use is the natural solution and the natural choice. This graft replacement technique is used in human surgery throughout the world, chosen for the best athletes, footballers and Olympic skiers. A graft replacement technique is available for your dog at Astonlee Veterinary Hospital. The cranial cruciate ligament is the most important of two cruciate ligaments, the other being the caudal cruciate ligament, which crosses over the middle of the stifle/knee joint in the dog or human and other mammalian species. It provides important stability for the stifle joint, whilst allowing the dog to run and walk without the stifle collapsing, and is, therefore, an important part of the function of this joint. The two main causes are attributed to the rupture or failure of the cruciate ligament. Firstly is trauma or accident when the dog runs and jumps after a ball, or jumps over a gate, or even sometimes simply jumping off a bed awkwardly. This is commonly known as ‘the footballers’ injury’ because humans playing this sport suffer from this injury when they run for the ball into the corner of the pitch and then turn and twist whilst travelling forward to kick the ball back across towards the goal. The second cause is wear and tear over sometimes years during which various traumas have occurred which lead to a weakening of the cruciate ligament, and sometimes this wear and tear leads to the development of arthritis which has been considered as part of the cause of weakening of the ligament which can eventually rupture when the dog is doing something fairly unremarkable such as being out for a walk. Signs of cruciate injury include acute sudden onset lameness, or it can be a slow realisation that the dog has developed a consistent lameness in a hind leg over some months or even a year. When the cruciate ligament is ruptured, there is a persistent lameness which may improve with pain relief, but there tends to be a loss of power in the leg associated with an inability of the dog to jump or run or walk normally. There is a typical touching of the toe to the ground in the standing position. The degree of lameness associated with cruciate rupture varies from slight, though moderate to severe with the dog carrying the leg right off the ground. How is a cruciate ligament injury Diagnosed? The diagnosis of cruciate ligament injury is often with careful listening to the description of the observations by the dog owner, most of whom observe their dogs in great detail and refer to signs such as those listed above. The specific diagnosis is most often made by the vet feeling for instability in the stifle joint through eliciting the ‘cranial drawer’ movement illustrated in this picture. This is diagnostic in experienced hands and I think this is the most reliable test for the diagnosis. Radiographs can help in supporting the diagnosis and seeing if there are any other musculoskeletal problems present at the same time. How is a cruciate ligament injury treated? - Conservative management such as rest, physiotherapy or hydrotherapy, which sometimes can help to restore function of the leg. - A surgical procedure using a lateral suture which is where a suture is placed around the joint to help mimic the torn cruciate ligament and provide some stability. This can be useful for some small dogs in particular. - A surgical procedure using a graft replacement technique such as the one most commonly used at Astonlee Veterinary Hospital. This offers the most accurate replacement of the torn ligament of any procedure. 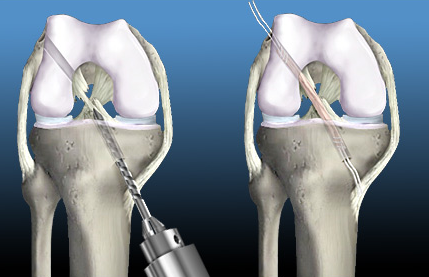 - A surgical procedure using a bone sawing or osteotomy technique such as the TPLO. This is a very invasive technique involving the creation of a saw cut into and/or right through the tibia with the aim of changing the biomechanics of the leg being operated on. Please see below for more information on frequently asked questions. What is the likely success rate with your operation in your hands? 96% return to ‘normal’; ie : the walking/running capabilities the dog had before the rupture of the cruciate ligament. 2% chance of being slightly lame. 2% failure rate. What are the treatment choices for my dog? Some dog owners have been slightly confused about the difference between the extracapsular suture and the intracapsular technique. There are a few different bone sawing techniques nowadays, but none actually replace the torn ligament, relying on a change in bone alignment to address the problem. The extracapsular techniques involve the placement of a suture, often of nylon or sometimes a new and stronger material that is also better in terms of tying more secure knots, outside the stifle joint to mimic the biomechanics of the original undamaged stifle joint. The intracapsular techniques involve the placement of a suture or graft through bone tunnels across the inside of the joint, replicating the position of the old damaged cranial cruciate ligament, but years of experience can overcome that and other technical challenges. The two techniques are therefore very different. It is more difficult to place the graft accurately across the middle of the joint than it is to place a suture outside of the joint, but the stability achievable by the intracapsular graft can be significantly better than the extracapsular suture, and arguably more reliable. Lateral sutures can be suitable for small dogs less than 15kg in bodyweight, but in larger dogs there is quite a tendency for the lateral suture of commonly used nylon to stretch or break and the effectiveness can be lost, whereas the study in the vets' section on this website shows something of the reliability of the skin graft technique. Why do you choose your skin graft technique? I choose skin as my preferred graft because published papers in the 1960’s and 70’s showed it was better than nylon or fascia (Vaughan 1966 at the Royal Veterinary College). No other technique replaces the ruptured cruciate ligament in the position in which it achieves re stabilisation of the stifle joint, which I believe is essential to the restoration of normal function in the long term. Sawing the bone without replacing the ruptured ligament seems to me like an idea that no human patients would contemplate for themselves, so why would they think of doing it for their dogs? Premiership footballers (humans) have their cruciate ligaments repaired using tunnel and graft techniques, and they can still be playing in the same League 10 years later. What are the costs of each choice of procedure? Using a skin graft with 2 bone tunnels in my chosen technique costs between £1500 and £2400,depending on size of dog and complexity of the particular case. This is an all inclusive price including the x rays, anaesthetics, post operative medication. Extracapsular suture is likely to cost about £1000. Bone sawing/osteotomy techniques commonly cost in the region of £4000. What is the potential for things to go wrong? My results show that there is only a 2% chance of the operation ‘failing’ which has been judged by myself and my clients in that the operation has failed to restore the leg to normal function with the ability to play, walk and run. When the operation has failed, it is usually within the first 3 months after the operation when perhaps the skin graft has not healed properly or the graft itself failed, or the dog has exercised too violently before the end of the strict 3 months post op period of ‘strict lead exercise only’. This compares to published results for bone sawing techniques where the quite serious complication rates can be in the range 8% to as high as 25%. How do I manage the perfect recovery for my dog? The most important things to do are lead exercise only for 3 months starting with 5-10 minutes three times daily in the first month after the graft surgery, and no jumping or chasing cats, and no stairs or steps. There is no need to keep your dog in a cage as many surgeons recommend after the bone sawing operations, but hazards such as stairs (block them off with a tall stairgate), managing the risk of tripping over steps in the garden or from the patio door with thought and ramps, ensuring that your dog does not try to jump into or out of a boot of the car at some height off the ground are all risks that can be managed with some care and forethought. Failures are very rare (1-2%) but practically all occur in the first 3 months following the graft surgery. So it is well worth putting in the effort to manage the 3 month post operative period for the sake opf a good rersult for the rest of the dog's life. I often stress the point that the care you dog owners put into looking after your dogs in the 3 month post operative period is just as important as the surgery I do for them. I have heard the meniscal cartilage can be a problem with some techniques? In all of the 35 years I have been doing the graft procedure, I have never had a case where I have had to operate on the cartilage at the same time, and never had a case in which I had to re-operate some time later because of cartilage problems. I have heard a clunking noise when my dog walks lame. What is this? Some dogs do have an audible click or clunk after rupturing their cruciate ligament, and sometimes it happens after cruciate surgery, in my experience most often between 1 and 2 months after the surgery. I have heard it most in Springer Spaniels, but in all cases I have experienced it has disappeared after the 2 months after the surgery. It appears not to be a problem following the graft technique. 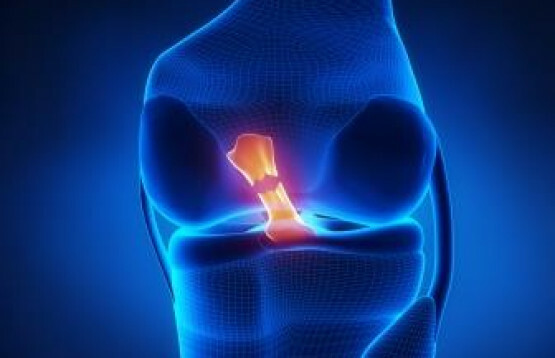 Although I have not proved it, I think this is due to a settling down of the cartilages in the knee after the surgery, the crucially important point being that restabilisation of the joint with the graft enables the other structures (if damaged) to settle down without further intervention. If the operation does fail, what can be done about it? In the small number of cases where the operation has failed, one was a very old Yorkshire Terrier so it was decided that the old dog should have a choice and not go through another operation, and he was happy to potter around with a limp for his last year or so. The procedure does not alter the alignment of the leg (bone osteotomy techniques do), and the situation in a failed operation using the tunnel and graft techniques is almost the same as it was before the operation was carried out. It is a relatively uncomplicated procedure to repeat the operation and insert another skin graft, which is highly likely to succeed. I have done this in 2 cases over a thirty year period in which there was a postoperative infection 1 month after the operation, and the second operation in both cases was successful. This compares to very serious potential complications with bone sawing techniques where there have been failures of the stainless steel plates and/or screws, and the potential for arthritis to develop seems to be much higher with the bone sawing which is a much more aggressive technique than using a skin graft. The costs of attending to the 1% minor complications and 0.5% major complications with the skin graft technique in my hands is very small in my hands, perhaps a few hundred pounds if the need arises. However, the costs of correcting complications from the bone sawing operations used elsewhere can amount to many thousands of pounds as I have discovered from telephone calls and meeting clients who have experienced this. The worst cost in 3 cases reported to me by dog owners was that 3 different dog owners spent £25,000 on cruciate surgeries for their individual dogs, the costs being made up of between £4,000 and £6,500 for each of a series of 3-4 operations starting with one TPLO and then re-operating to deal with complications afterwards. With the graft technique using full thickness skin as I do, the complications I have seen have included minor cyst formation under the skin where a cyst forms in the end of the skin graft. This has been reported by Prof Vaughan in 1960's, and is easily remedied by simply excising the cyst under a general anaesthetic, but some of these do not require surgery and can be left alone. Very rarely, (about 2 cases in the past 30+ years), an infection can occur in the joint after the operation, and this can cause the graft to fail. In two cases that I have seen this happen, I have re-operated on them (one GSD and one Mastiff), flushed out and debrided the joint thoroughly, removed the old graft and inserted a new one, provided one month on two antibiotics, and instructed the owners to give 3 months' lead exercise. In both of these cases a full recovery was made and the costs I kept to £500 for each owner (true at June 2013). One dog had severe obesity and ruptured the skin graft as reported in my case report in the vets' section of this website, and a couple of Yorkshire Terriers have had a rupture of the graft which I believe was because the skin in those particular dogs was weak. In one of the two Yorkies seen over 30+ years who had this problem, I repeated the operation and supported the procedure with an extracapsular suture which worked well. Current research at Astonlee on complications with cruciate surgeryis looking into the finding that in the very few cases where the graft fails, it appears to be due to infection, with occasional lapses of the dog owner to find their dog failing to follow the instruction of ‘strict lead exercise for 3 months after the operation.’ Infection is the most serious complication, and at 0.5% at Astonlee this compares very well with other published reports of 7% and more in other veterinary facilities. Many published reports of complication rates for TPLO report that 7% is due to infection with the remainder due to other reasons. In some reports on TPLO there have been 36% complication rates (Garnett and Daye (2014) JAAHA 50 (6), 396-404). Until August of 2013, I had not had a case where I inserted a skin graft where the infection was a cause of a major complication that could not easily be resolved. That case was a 73kg Newfoundland dog where there seemed to be an infection developing in the distal bone tunnel, because the proximal bone tunnel had the skin graft firmly locked into position 4 weeks after the operation as identified at the time of remedial surgery, whereas in the distal bone tunnel the graft had not securely locked in. This is stimulating some further research at Astonlee into the technical points involving the fixation method for the graft, which is something tt has stimulated huge amounts of research in the published literature in the human field where they use dissolvable screws. This research is ongoing. The case of the Mastiff mentioned above was also due to infection, as was the German Shepherd, and in both of these two cases the graft failed 1 month after the surgery, having both been making excellent progress immediately after the first operation. The Mastiff didn’t do as well as the GSD in the first month, but after each dog had been re-operated on, antibiotics given for a longer course because the infection was identified with the presence of swelling and discoloured fluid, both dogs made excellent recoveries. These 3 cases in which failure occurred due to infection were all referrals from outside the area of Astonlee, and may have had problems due to their environment. The GSD was a working dog which was initially uncontrolled by the owner, and was working in dirty conditions. The Mastiff was daily playing in a horse yard where there was lots of horse manure around. The Newfoundland was a very clean dog, but had as Newfoundland dogs do have very long fur, and there may have been some infection in the skin. In the Newfoundland, detailed follow up has not been available, and although the dog was doing very well until 3 months after the operation, a problem seemed to occur when an unfortunate incident occurred when another big dog caused the Newfoundland to jump and twist the operated leg badly. Every aseptic precaution is taken at Astonlee where we have high standards of hygiene. However, if the infection is carried in with the dog, that could be a reason why we have experienced a few complications. We are looking into the possibilities of examining and shaving the dogs 2 weeks before surgery especially in the case of long haired breeds where we cannot see the skin otherwise before carrying out the surgery. Another consideration is whether to change the antibiotic procedures to have a pre-operative examination and swab to culture from the skin before going ahead with the surgical procedure. Another consideration is whether or not to change the antibiotic in routine use from potentiated amoxicillin (Synulox) to cephalexin or other choice of antibiotic to combat what in some cases could be antibiotic resistance by the bacteria on the skin. This point could apply to any choice of surgical procedure. Another point to consider is whether or not the dog has any underlying or even apparent skin infection with any red spots for example at the time when surgery is being considered, planned or carried out. In human surgery, the choice of grafts is normally a tendon graft which will have no exposure to the outside of the body as in the choice of skin. Breakdown and complications due to implants of various types, including the plates and screws used in TPLO’s for example (which is well documented in published papers), can occur, so the issue is not confined to the use of skin. In human surgery, national audits are carried out to study the cost effectiveness of various types of orthopaedic surgery including knee and hip surgeries. We have not got this level of research in veterinary work, but at Astonlee we are working to try to make some progress in this important area. It is very interesting that the numbers of cases at Astonlee where post-operative infections have occurred seem to be very low indeed compared to other published works in different veterinary centres, in spite of the fact that at Astonlee the technique actually involves embedding a full thickness skin graft into the joint through 2 bone tunnels. It could be that the standard of aseptic technique is critically important, and the detail of those procedures is where to find the solution to minimise or eliminate the problem. Making the diagnosis: as you cannot see the ligament on an x ray, why are x rays taken? I am personally confident that I can diagnose the vast majority of ruptured cruciate ligaments in my consulting room by observation and feeling the joint. Some dogs are difficult to examine, and sometimes sedation or anaesthesia is needed to get the doig to relax to enable palpation to be diagnostic. This requires skill and experience as it is not always easy to make this diagnosis accurately, especially when it is critically importqant to the decision whether or not to take the dog to surgery. Taking x rays is important because there can be conditions which occur at the same time as a ruptured cruciate ligament, and these include the occasional presence of a bone tumour in some Rottweillers for example, or osteoarthritis in the stifle(s) of hips. The x rays help in gaining a better and more complete understanding of the problems involved and the likely outcomes, should there be any concurrent problems. What are the chances that the opposite leg will need surgery? My results with my technique show that there is about a 10% chance that the opposite leg will need surgery for the same problem. This compares to most other published results where the chances range from a minimum of about 50% to 80% chance. How long have you been using your technique? Since I qualified in 1979 from Cambridge University where I was taught how to do it. If you have a question that is not answered above, please contact me and I will try to answer it for you. How do vets and clients ulimately make their decision to recommend or choose a particular surgical technique for a surgical correction of a ruptured cruciate ligament? There is an increasing interest in evidence based medicine (EBM) whereby vets have tended to start looking more earnestly and critically at the evidence for choosing a particular technique or surgeon, and what facilities might be best for the patient. There is little published evidence suitable for making comparisons between techniques, and a key reason why comparisons have not been made has been a lack of recognition of a research instrument or method that can consistently demonstrate the outcome evaluation. I have been doing a piece of research looking into what the profession considers the best and most practical outcome measure to be, by using a questionnaire. I am also interested in having dog owning clients fill in this questionnaire to get their views on how they evaluate the success or otherwise of the surgery for themselves. If you would like to participate in this survey, please email your request for a questionnaire and one will be forwarded to you (email : admin@astonlee.co.uk ref : cruciate questionnaire attention Paul Manning). Alternatively you can copy and paste the questionnaire below. By doing this research I hope to be able to produce what is called in the jargon a 'Health Related Quality of Life (HRQL) instrument which is widely accepted'. With this development should come a greater critical awareness of the different surgical options available, which I hope will help to deliver better and better patient care for the future. How quickly after the dog has suffered the cruciate ligament rupture should the surgery be done? There are some conflicting thoughts on this because the aim of different surgical techniques varies in the degree of stability the choice of operation will achieve. The results I have seen from my own surgeries include many dogs who have waited from 7 days to up to 2 years before having their operation. Sometimes the reason for the delay has been a need to give a few days' notice to book the dog in for the surgery, to the reason that a client may have had to save up for the operation over a period in excess of 6 months, and some clients have eventually found their way to my surgery after hesitating from between 1 and 2 years under the care of a vet who may have been less positive about the potential outcome or may have had reservations about operating at a senior age of a dog for example. In all of these cases, the outcome has been excellent and still within the 96% success rate reported in the vets section of this website. So the answer to this question is that whilst surgery should not ideally be delayed more than 2-3 weeks because instability can cause early onset of arthritis, there does not appear to be any deleterious effect by delaying 2-3 weeks. This is important because some clients have made arrangements to go on holiday or go to an event that has been planned a long way in advance, and it is useful to know that a short delay does not appear to affect the outcome. It should be stressed that cruciate surgery is definitely not an emergency situation requiring immediate attention. Will my dog have to be in a plaster cast, cage rested, and any other constraints during the recovery after the operation? With the technique I use (a skin graft and two bone tunnels) the main instruction for dog owners is to keep the dog on a lead for exercise for 3 months after the operation. There is no need to keep the dog in a cage and I encourage owners to walk their dogs starting with a hundred yards in the first 2 days, and gradually increasing to 3 or miles a day towards the last month of the recovery period which is normally 3 months. There is no plaster cast or bandage. This contrasts to dogs which have the TPLO or some other bone sawing techniques where the advice frequently given is to cage rest the dog for 6 weeks after the operation to allow time for the elected osteotomy to heal with the plate and screws in place. The other point here is that there ius evidence from my own work (see vets section on this website) that replacing the torn ligament with a graft can restore joint stability with a very high success rate as measured by the reduction and elimination or minimising of the cranial drawer and the restoration of limb function In the technique chosen by many vets to use TPLO and/or other osteotomy procedures, there is no agreement on what the reconstruicted joint and bone alignement should look like. This is a critically important point in my view because the aim of the surgery needs to be clear in order to maximise the chances of success. The key questiuon for those advocating the TPLO is how many millimeters should the angle of the tibial plateau be in any given breed, age and weight of dog? Secondly, how is it possiblt to know that the angle created immediately after surgery will remain the same over the passage of years when some bone remodelling and potentially some osteoarthritis develps? These are very difficult questions to answer because it is argued that every dog is different, but then it should be possible to calculate the angle for any given dog from principles, but there is no wide agreement on this in the veterinary community. On the other hand, using the graft technique that I use, the key question is what should the cranial drawer movement be when the surgery is completed? That is easy to answer : it should and can be 0mm. In some cases which have a huge cranial drawer movement before the surgery, I have found that the clinical outcome cvan be equally as good if the cranial drawer is reduced to within the range 0mm to 1mm. I have heard that grafts are not favoured by many vets in larger dogs because of a fear of failure of the graft, and that is why many vets recommend the TPLO or other bone sawing techniques? The evidence from my results over the past 30 odd years (see vets' section on this website) is that the same technique of using 2 bone tunnels and a full thickness skin graft works equally well in a wide range of breeds, bodyweights and ages of dog from the tiny Yorkshire Terrier right up to the Giant breed such as the Great Dane. The photo on this website of a skin graft which was placed in a large labrador 8 years before he reached the end of his natural life at age 15 years illustrates the survival and integrity of the graft many years after the surgery. The science of transplantation medicine is a fascinating one, and there are many examples in human medicine where organs and tissues have been used to replace damaged or diseased structures. One of the points that has attracted me to this skin graft technique is that it offers the patient the chance of a restoration of the original ligament with a natural graft which can restore and replace the torn ligament, and survive in the body without risk of any mechanical failure from insertions of metallic or other non biological materials. Additional reading can be done by visiting our Vets section , and our 'client testimonials' section. Clinical decision making in canine cruciate surgery. Some clients are understandably a bit nervous about having surgery on their dog at all, but I believe if the function is evaluated and discussed carefully between vet and dog owner, a plan can be made to restore the joint in the vast majority of cases. Having spent this time working with cruciate problems, I have found that for many, the surgical option with a graft is the best one. In choosing to operate, the diagnosis needs to be accurate, and that is best by using the physical examination for the cranial drawer which indicates a looseness in the stifle joint specifically due to rupture of the cranial cruciate ligament. Sometimes there is swelling and lameness, but the ligament proves to be intact, so in these cases surgery is not indicated in my opinion. The important question when considering the best course of action is 'is the ligament torn or not, and is the limb functional or not?' If surgery is the choice made after a period of conservative management, it is good to have seen what level of activity can be achieved without surgery first. I have found that in some dogs the instability is tiny with hardly any lameness present, some have a tiny instability with severe lameness that has been corrected fully with replacement of the confirmed ruptured cruciate ligament, and some are only moderately lame with massive instability also corrected by a replacement graft. The writer on this website (www.tiggerpoz.com ) airs some concerns about choosing to operate when it might not be necessary. I believe that the best material for the purpose is the dog’s own skin. Part of the evidence for the survival of the skin graft long term is on my website (vets section) in a picture of the microscopic appearance of the graft in a stifle joint of a 15 year old Labrador in which I placed the skin graft 8 years earlier. The owner kindly agreed for me to do a post mortem because she was so pleased with the outcome for her dog and wanted to be able to share this information with other dog owners. Prof Vaughan studied differences between grafts of skin, fascia lata and nylon in 1966, and found that skin was the best. Two commercial companies have been exploring the use and development of artificial grafts for the re-stabilisation of the stifle following cruciate rupture. Arthrex have developed fibrewire, and Vetlig have been looking at some different types of artificial graft. However, in human surgery the body of opinion is a move away from artificial grafts to natural autografts of patella tendon or hamstring due to concerns and findings of breakdown or rubbing of the bone tunnels which can become wider and render the graft ineffective over time. Natural grafts can become strong and re-vascularised, and last a long time, and are able to form a unique part of the natural joint in its restoration. The evidence that is required to produce the high grade research papers that would be considered stronger evidence in the peer reviewed literature is prevented from becoming reality because there is no widely agreed method of evaluating the outcome of the cruciate surgery. If this was agreed, as it is in human surgery (although still with lots of on-going debate;eg: the IKDC system which you can Google), it would be possible to collect vastly more cases to pool together from around the world to produce an evaluation and comparison with much greater statistical power. I attach a couple of questionnaires that I have designed and have been using to capture data from vets and clients evaluating the clinical outcomes. I would be interested in your opinions and thoughts on these, especially if and when you choose to have surgery on your dog. If you would fill in the questionnaire and forward it to me that would be much appreciated as I am gathering the opinions of dog owners. I hope to be able to cultivate this body of data by encouraging dog owners and vets to contribute to the debate, research and discussion using the questionnaires and feedback. The evidence that I have produced on my own website is the best I have been able to produce. However, the data is from real cases and 100 of them followed over 15 years. The biggest problem I have is that most vets do not believe the results, but as clients have been involved in the evaluation as well as myself, many clients empathise with the results because they represent their peer group. I also believe that ultimately the clients are the best judge of the outcome because they are observing their dogs for many hours each day in their daily activities, often for many years before and after the surgery, and clients can see if their dogs can return to the agility competitions, running 10 kilometres a day with the owner, and other activities, and that to me sounds like the best way of evaluating the outcomes. Clients who have chosen me to operate on their dogs have testified to this return to normal activity after the surgery. Some clients have challenged me to operate when the dog was only slightly lame and only intermittently, with hardly any instability detected by the cranial drawer test. This needs very careful consideration before deciding to do the surgery because clinically the challenge for the surgeon is to improve the situation and not make it worse, but also different clients have different perceptions of the need for surgery in their particular dog. No surgery is 100%, so if the problem is small, it's best to take special care with the decision. Not every dog that is slightly lame due to a partial cruciate tear or injury will go badly lame later and some will function well, so I have found it sometimes pays not to be too hasty. On the other hand, some very large dogs like some Rottweillers can run into trouble if one leg is left and the opposite leg suffers a ruptured cruciate ligament at the same time. Some of these cases can be very challenging to operate and get the dog back on all 4 feet. So the issues to consider can be complex, but over 30 years of experience can be helpful.